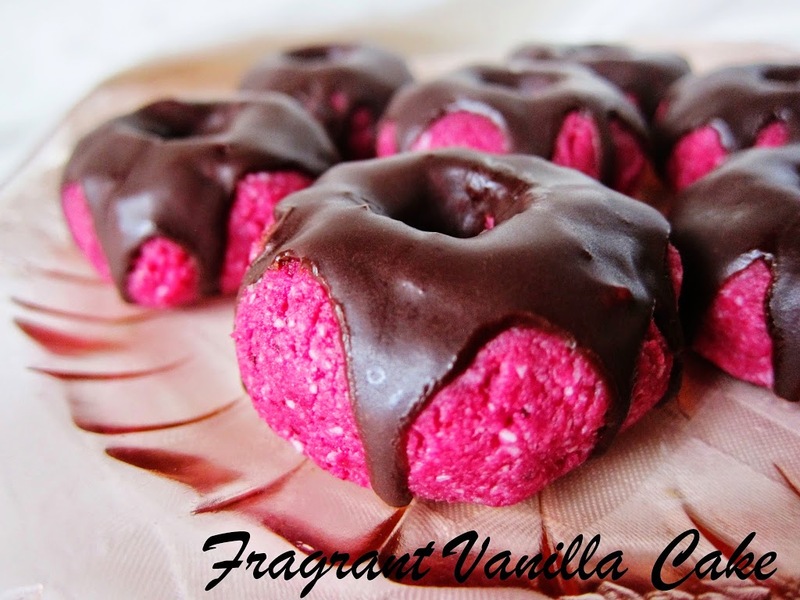 I was craving raw doughnuts this weekend. But the problem was I didn't know which kind to make. It was between Dark Chocolate with Salted Caramel, Apple Walnut Spice, and Red Velvet. So I took a poll on Facebook and it was unanimous, Red Velvet won. Although I will try making the other two soon, I liked the idea of red velvet. So I was quite excited to make them! If you read this blog often, you know that I love to use beets in my red velvet. Before anyone goes hating on beets, you can't taste them at all, I promise. They just add this amazing color! I think it is even prettier than food coloring. For the doughnut base besides the beets, I used a mixture of almonds and coconut because it makes a delicious light dough. I could have just eaten the dough in fact, but that would defeat the purpose of doughnuts. So would wait until they were dehydrated to enjoy. But first they had to be glazed. 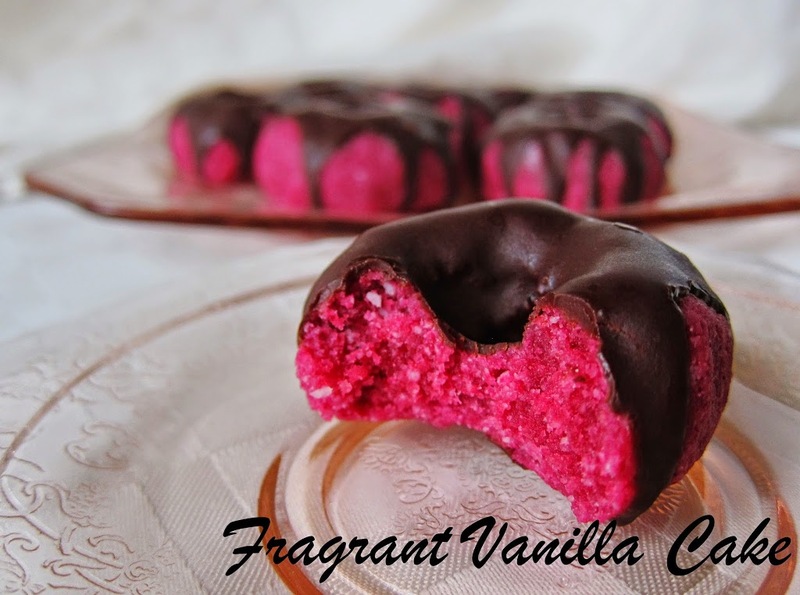 I admit, I was going to go traditional and make a raw coconut "cream cheese", but I went with raw chocolate glaze instead. Chocolate glaze is just so much sexier anyhow. 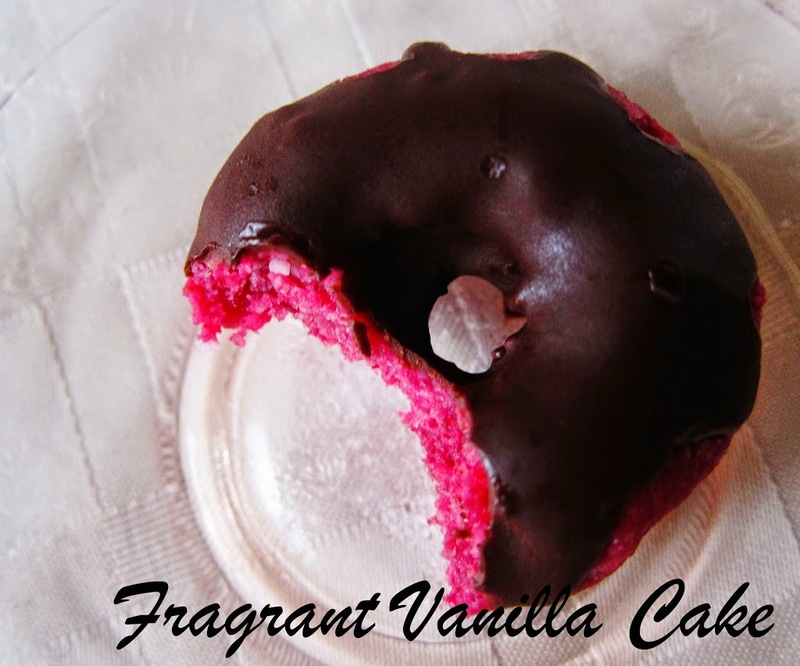 Who can resist a doughnut with shiny dark chocolate dripping down it? I was glad I did, because the combination was heavenly! I admit I took down quite a few of these! To make the doughnuts, combine all ingredients and process until smooth. Shape into 16 balls, and then shape into doughnuts and place on a dehydrator sheet. Dry for about 8 hours or until not sticky. To make the glaze, whisk all ingredients until smooth. Let sit a little while to thicken. Place the doughnuts on a drying rack. Drizzle the glaze over the doughnuts, then them on a foil lined sheet pan. Place in the freezer to harden for a few minutes. Remove from freezer, and serve! What if you don't have a dehydrator? You can use a really low oven temp (as low as it will go), it will just take less time. Or you can skip dehydrating if you don't mind them being a little moist. yummmmm Amy! You've outdone yourself again! 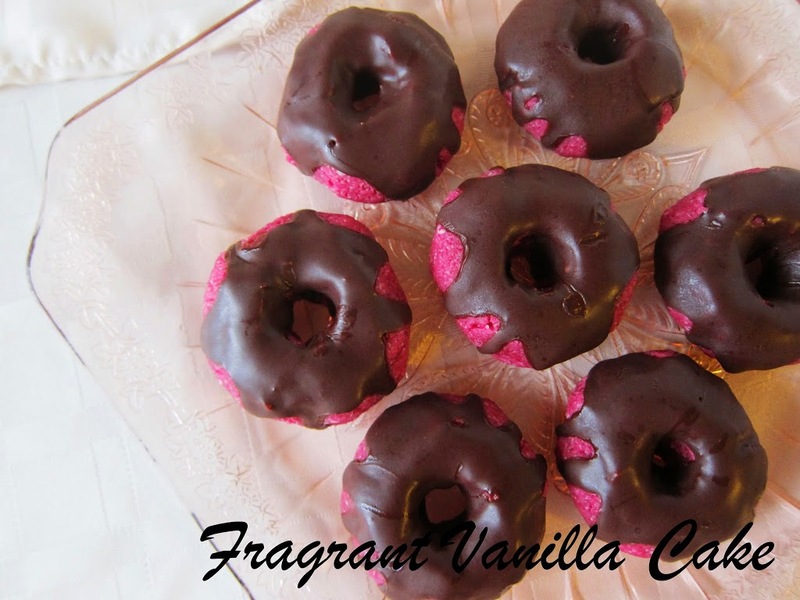 Love a chocolate glaze on raw donuts! Thank you Heather :)! The glaze was the right descision ;)! I would like to know too? Would the oven on low setting work? Snd if so, about how long? Yes it would, at the lowest setting, it will just take less time. Thanks so much Liz :)! Haha, we are definitely on the same wavelength! Beets make the perfect non-food coloring red color. Yours came out so pretty!! The icing really takes it over the top! Thanks Lauren :)! Beets are the best food coloring, the color is more beautiful as far as I am concerned ;)! I'm crazy for all things red velvet! These look fab! Thank you :)! Me too! That sounds like an ever better idea! Thank you :)! That sounds really good too! I will have to try that! I got a dehydrator for a gift last Christmas and never used it. This recipe made me pull it out of the closet. I'm ready to give the dehydrator a try! I'm in the process of making the "dough" right now. Thank you for such beautiful looking and simple recipes . I can't wait to try more of them! Awesome! I got mine from my Dad since he never used it! Funny how that works ;)! So glad you are trying out the recipe :)! OMG! These look stunning! I'm grabbing ingredients tomorrow to give these a whirl :) Sadly I don't have a dehydrator, so I'll be using my trusty old oven. Fingers crossed!! Thank you :)! Hope you enjoy them as much as I did! On the upside the oven is faster! Yay :)! So glad you enjoyed them! I am happy to share! This looks amazing... 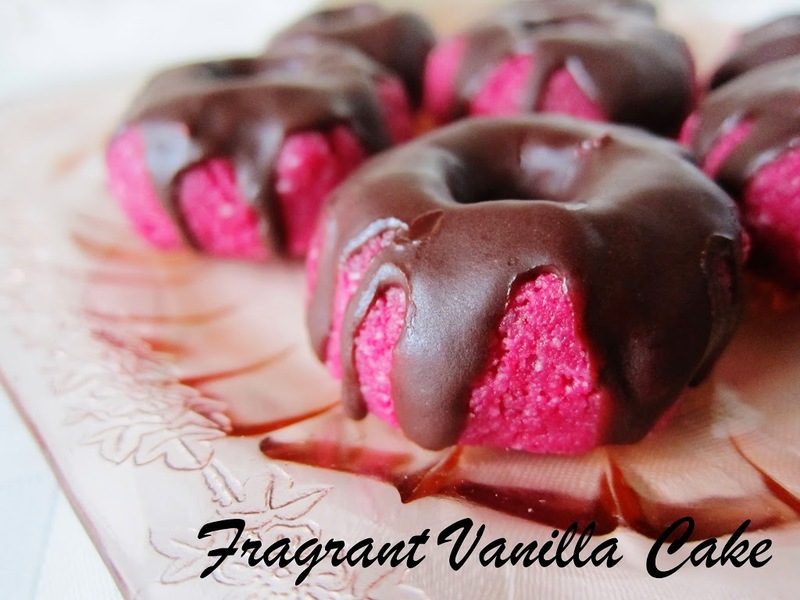 I nearly skipped over this recipe because I don't use food coloring! They look so decadent. I don't either ;)! Beets provide such a lovely color, happy you stopped by! Hey, these are great! I actually made them sans glaze, but they're going to be perfect Christmas/birthday gifts for my vegan and/or gluten-free friends. Thanks! Awesome Holly :)! So happy you decided to try the recipe! Hola, estoy enamorada de tus donas desde que las vi, intente hacerlas con colorante, pero hasta ahora que traduzco la pagina veo que no las freiste y es por eso que el color esta intacto, yo freí las mias y me quedaron fatales, solo a la hora de morderlas se veía el color... pero mi duda es, la forma de las donas las haces a mano???? These are not fried, they are raw doughnuts that are dehydrated. I am so happy to hear you enjoy my recipes and decided to go plant based :)! The temperature should be 115F degrees. Amy, can you just omit the beet if you don't care about the color? Maybe add a date or two if it needs a bit of that "stickiness?"